There are times when you want to make the whole business of baking fast and easy. My son’s 10th birthday was one of those times. He wanted a store-bought cake because he wanted it themed. To be specific, he wanted an agar.io-themed birthday cake. If you haven’t heard of agar.io, it’s a multiplayer action game where you’re a circle (also known as a cell), and your objective is to eat up the smaller cells and avoid being eaten by larger ones. 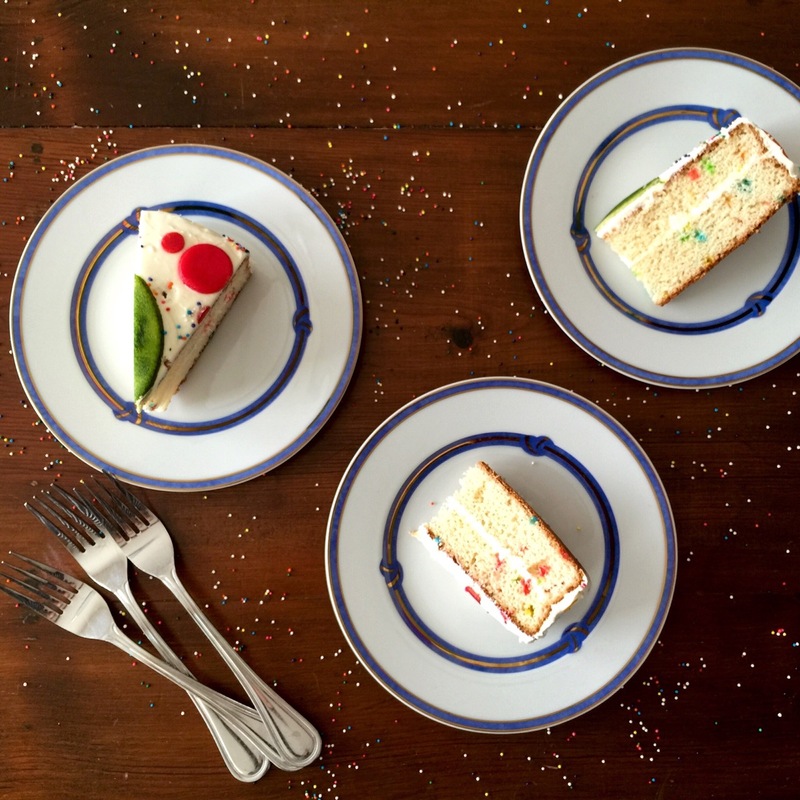 Think petri dish filled with colorful sprinkles. In our little town, there was no agar.io-themed birthday cake to be had. If he wanted it, we would have to make it. And when I say “we,” I mean me. One of the recipes on my to do list for the Kitchen was to try one cup of starter with a boxed cake mix. Since I knew there was a sprinkly cake mix on the market, this felt like the perfect time to give it a go. I also grabbed vanilla frosting and some marzipan off the shelf. We have recipes to make both of these from scratch in the Recipe Box, but remember, I was going for fast and easy. I had a birthday party to organize! For me, including a cup of Amish Friendship Bread in your baked goods is a way to pass on love from you, your kitchen, and those who contributed to your starter before it came to you. It’s good mojo. Plus there’s that subtle sourdough tang that marks every loaf of Amish Friendship Bread ever made. Most boxed cake mixes already have pudding in it, so all I needed to do was add my starter. Because I was adding extra liquid (and flour and sugar) to the mix, I reduced the water from 1 cup to ½ cup, and reduced the oil from ½ cup to ⅓ cup. I was using whole eggs, so I knew it would bind together well enough. 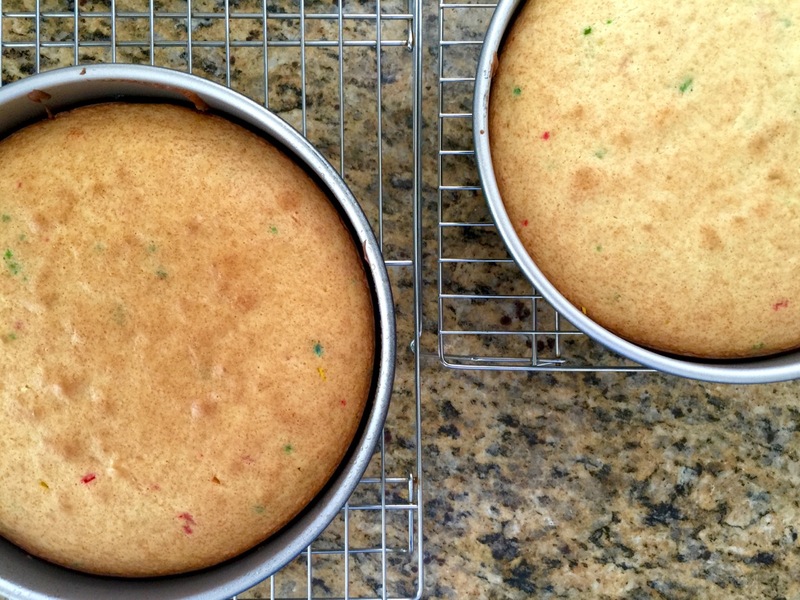 I followed the directions and mixed it all up, dividing the batter into two 8″ cake pans. Into the preheated 350° F oven they went. Now it was time to have some fun. I rolled out the marzipan, which is an almond paste people use to make shapes and decorative elements on cakes. You’ll find a generous slab of it inside a Christmas stollen. Once I rolled it out I looked around for anything that could help me cut out different sized circles — a one-cup measuring cup, the lid to food coloring gel and another lid to the sprinkles jar. I then used food coloring to paint the circles. My tip is to go light and then layer it on — if you paint too much it takes forever to dry. I had to dab the blue to pull a bit of the color off because it insisted on staying damp. I’d also recommend making and coloring the shapes ahead of time (you can store them wrapped in the fridge). It ended up being the most time-consuming part of the whole process, at least for me. The cakes came out and they not only looked great, they smelled like Amish Friendship Bread. I’m not kidding! A tad sweeter, yes, but even one of my other kids wandered in and asked if I was making Amish Friendship Bread. So there you go. 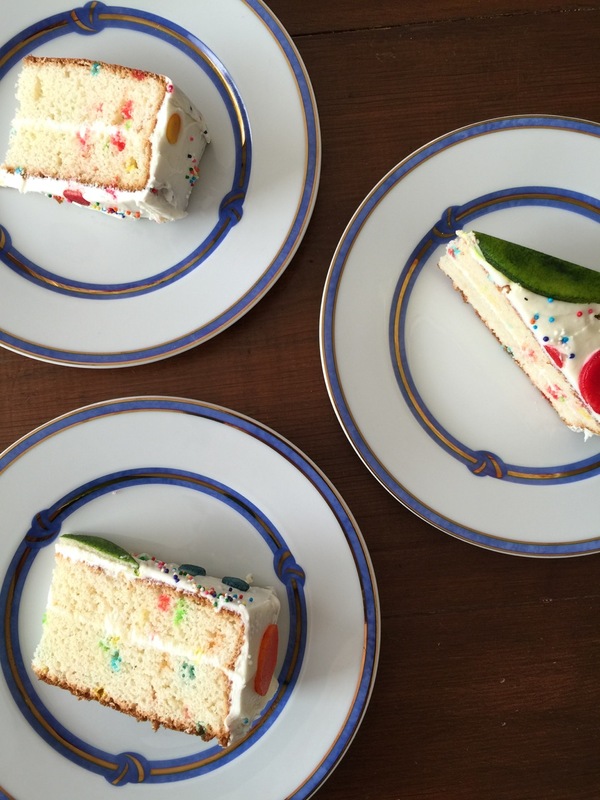 I wanted a double-layer cake, so I sliced off the tops of both cakes using a serrated knife. Once that was done I frosted the top of one of the cakes, then put the other one cut-side down on top of it. This gave me a clean edge around the top and sides of the cake. I then went ahead and frosted the whole thing. It was now much later in the day than I had planned because those agar.io cells took longer to paint and dry. I had outlined one of the cake pans on a sheet of parchment and practiced where I’d place the shapes so I wouldn’t make a mistake when it was time to do it for real. I’m pretty sure some food coloring would have stained the frosting if I tried to make the shapes around after the fact. Pre-planning the placement made it easy when the time came, and then I liberally tossed small colored sprinkles to represent the smallest, totally-don’t-have-a chance cells that would pretty much be eaten up in a single gulp in the game (and, once this cake was served, in life). My son’s birthday was the next day, so I put the whole thing in a cake carrier and put it in the fridge. When it was time to serve it mid morning, it had set up beautifully and the cake was still tender and moist. It was easy to cut into the cake, too. Add a little something special to any boxed cake mix by adding 1 cup of Amish Friendship Bread starter. You'll pass on love from you, your kitchen, and those who contributed to your starter before it came to you. In a large mixing bowl, add ingredients as listed. Mix well. Grease two 8" cake pans. Bake for 30-40 minutes or until the bread loosens evenly from the sides and a toothpick inserted in the center of the bread comes out clean. If using marzipan to create decorative shapes or figures for your cake, prepare this before baking the cake, preferably the night before. I want to try this recipe for a family reunion coming up! I would like to make this recipe for my sister and my mom. they would like it.